UV radiation from supermarket lighting penetrates the surfaces of refrigerated products, heating them and causing premature decay and discoloration. 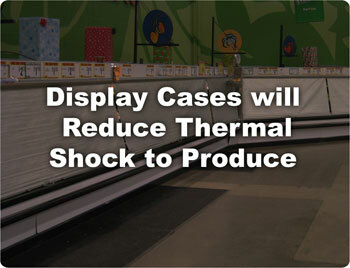 ECONOFROST insulating night covers protect all light and heat-sensitive merchandise from exposure to radiation during closed hours.ECONOFROST’s thermal blind blocks heat and UV radiation, extending the shelf life of perishable products on display within commercial refrigeration cases.Fresh foods and perishable merchandise exposed to the heat and dry air from grocery store aisles tends to dry, wilt and discolor resulting in lost or discounted product. When perishable goods in refrigerated display cases are protected from harmful UV radiation during closed hours, what was normally accepted as daily product loss can now be sold. 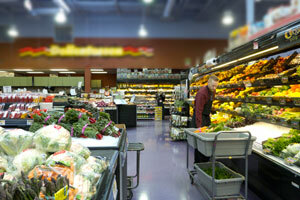 For fresh food retailers every item sold equals more profit especially when category loss is reduced. Perishable goods last longer in colder, more stable temperatures and ECONOFROST thermal curtains ensures both case and product temperatures are consistently cold while conserving energy and lowering electrical energy expenses. Protecting fresh foods and extending shelf life is one of the greatest benefits of using night covers. Night covers also provide one of the best returns and savings when it comes to reducing shrink and discard! Protect the integrity and saleability of your fresh food items and use ECONOFROST night covers to shield heat and light sensitive merchandise from over exposure to store heat and UV radiation. For many fresh food retailers the shrink and discard savings translate into a much quicker payback and even greater savings over the lifetime of their night covers. Retrofitting your refrigerated display cases with ECONOFROST thermal night curtains will not only extend the shelf life of your merchandise it will alsoprevent thermal shock from occurring and damaging foods so that your only choice is to throw the item out. ECONOFROST refrigeration blinds will keep optimum temperatures throughout the refrigerated case and shield perishable foods from premature spoilage so that your customers are rewarded with just naturally fresh and nutritional quality foods. Product savings can outweigh energy savings. Stop throwing out thousands of dollars in unnecessary food waste.